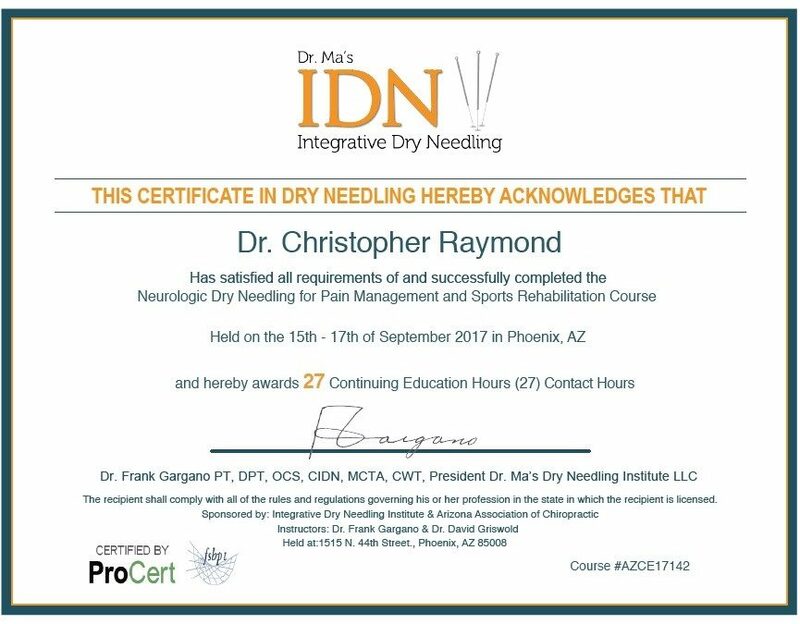 Dr. Raymond has recently been certified by the Integrative Dry Needling Institute to perform Neurologic Dry Needling for Pain Management and Sports Rehabilitation. Integrative Dry Needling is a highly effective form of therapy for the treatment of a multitude of musculoskeletal and neuromuscular conditions. It is not appropriate for all conditions or pathologies and the use of the technique will be at the discretion of your physician. Integrative dry needling is not acupuncture (traditional Chinese medicine), it is based on neuro-anatomy and modern scientific study of the musculoskeletal and neuromuscular systems. A very fine filament needle is inserted through the skin and into the deeper tissues that are considered trigger points to your pain. Dry needling works by causing a micro lesion within the pathological tissue thus breaking up shortened tissues, inhibiting a reflex arc from the nervous system to tissue, normalizing the inflammatory response and centrally mediating the pain. This mechanical and neuromuscular effect provides an environment that enhances the body’s ability to heal which ultimately reduces pain. The fine filament needle is very thin, solid, and flexible, which allows for the needle to be pushed through the skin versus cutting the skin. This helps reduce any discomfort that may occur with the procedure. We strive to make the treatment virtually painless however at times a local twitch response of the muscle may be felt. When the needle is inserted into the pathological tissue the local twitch response sensation is normal and is felt only momentarily. Many patients describe this twitch response as a little electric shock, cramp or an ache sensation. These sensations are perfectly normal and even a desirable response. Your physician will make every effort to make your experience comfortable and therapeutic. This will vary but many patients experience immediate relief of their symptoms and an increase in range of motion. Soreness can also be a common response from the needling but does not occur with all people. Some individuals may experience an immediate achiness or delayed soreness the next day. The soreness, if present, will usually last 1-2 days, use of heat and light massage and movement will be beneficial. Mild bruising may occur at the needling sites and is more prevalent in certain parts of the body. Larger bruising may also occur, but is rare. Application of ice on the bruise will help with soreness and the skin discoloration will last several days but is not harmful. It is uncommon but possible that the treatment may temporarily increase your symptoms. This is not unusual but if this continues past the 1-2 day window, inform your physician to allow adjustment of your program to enhance your comfort the next time. This does not mean that needling will not be beneficial to your condition. Yes, Your personalized therapy program will still integrate traditional physical therapy methods including manual therapy, therapeutic exercise, endurance training, stabilization and posture training. How many treatments will I need? This will depend on the category you fit in, which is determined by the state of the injury and your overall health. Remember we are attempting to cause mechanical and biochemical changes without any pharmacological means. Therefore, we are looking for a cumulative response to break the pain cycle. Your physician will be able to give you more insight after your evaluation. Not all medical or physical therapy professionals are trained to perform the Integrative Dry Needling treatment technique. Dr. Raymond has performed advanced training and has been certified through the Integrative Dry Needling Institute.